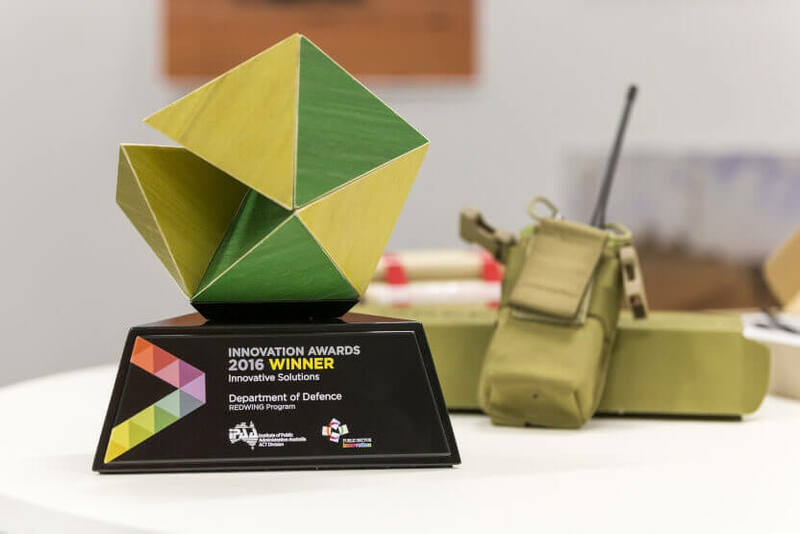 A Defence team has won an inaugural Institute of Public Administration Australia Public Sector Innovation Award for developing a suite of force protection products to assist in countering the global threat posed by improvised explosive devices (IEDs). The Redwing project was successful in the Innovative Solutions category that recognises new, improved and effective approaches to public administration. “The Redwing program saves lives. It offers a suite of practical counter IED devices that operate in austere environments,’’ said Department of Defence associate secretary, Brendan Sargeant. “The Redwing program is a fine example of innovation with Defence and industry working together to deliver an operational capability for the national good,” Chief Defence Scientist, Dr Alex Zelinksy said. Under the program, two robust, light-weight systems were developed – a handheld version called Greengum for use by dismounted troops and a more powerful system called Greygum for fitting to light vehicles. Greengum and Greygum systems were developed by the Defence Science and Technology Group, sponsored by Defence’s Counter-IED Task Force and manufactured by Australian industry under project co-ordination by the Australian Military Sales Office. Dr Zelinsky said the Redwing program is an exemplary success story for innovation, commercialisation and collaboration with industry. The Redwing industry partners include Micreo, Ultra Electronics, Associated Electronics Services, AXIOM Precision Manufacturing and Lintek. “To date Australia has supplied 100,000 units of the Redwing equipment to the Afghanistan National Security Forces, with a further 50,000 systems on order, to meet their security needs,” Dr Zelinsky said. Funding for these systems has been sourced from Australia’s annual contributions to the Afghanistan National Army Trust Fund, co-ordinated through Defence’s International Policy Division. Dr Zelinksy thanked team leader Darryn Smart, the principal electronics engineer Ben Barona, Katherine Thatcher and Rex Russell from the Australian Military Sales Office, and Tim Heenan from the Counter-IED Task Force.